A hell of a lot is the short answer! I've written loads this month for so...me reason! Latest outrages from Halifax and Lloyds, poor dog been diagnosed with Lymphoma just as news of cancellation of cover for life insurance delivered to owner who knew nothing of their exit from insurance until then. If they'd written ASAP he could have switched provider. The Amazing Endal award winners, really fantastic stories - so deserving. We're giving the medals out on May 12th at the London Pet Show Earl's Court - 3pm the Animal Action Ring. 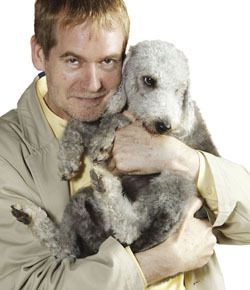 I interview new RSPCA boss Gavin Grant about what he has planned and it's going to be interesting with him at the helm! I tell the story of Robin and Jen Hollington whose son Richard was the 300th soldier killed in Afghanistan. Hound For Heroes recruit Yomper is named in his memory. Robin has thrown himself into fund raising and is launching the Dogs Dinner in this issue in aid of H4Hs. Karen Cornish tells us all about the attempts to rebrand the Staffie to make rehoming one of these dogs seem more attractive. And a fair few of the 53 dogs looking for homes in this issue are Staffies. We tell the stories of four dogs featured that have now found their happy endings. Jemima Harrison has a good close look at the newly launched Puppy Information Pack and gives her views. Karen Cornish is back again with a piece on food allergies and intolerances. Claire Horton-Bussey considers going vegetarian. And as part of the foodie theme we look at finding dog food with all the nasty bits left out and tracking down treats with no wheat. Lovely alternative vet Richard Allport tells you what to do if your dog is bitten by a snake - including a real life saving hint. Our celeb interviewer Natalya has double bubble this month talking to the owner of Uggie and atomic kitten Jennie Frost. Sarah Whitehead wants us to fill in a relationship survey - makes me feel like we're a proper mag like Cosmo! Peter Neville deals with a German Short-haired Pointer that loves the new kitten a bit too much as does the existing moggie! Our Jodie Nash writes up her experiences hiring a dog-friendly VW Campervan. Allen Parton looks back at Crufts and all the amazing things that happened for Hounds for Heroes there. Karen Wild Has written a great introduction to Grisha Stewart's fantastic Behaviour Adjustment Training and Jordan Shelley helps out my trying out the techniques on his dog Jaffa. 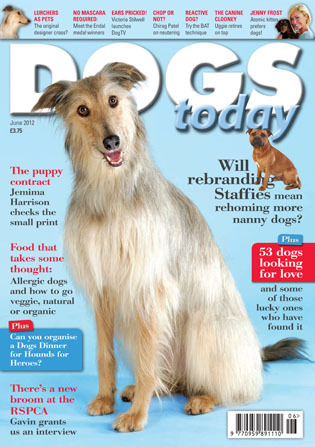 I don't know how it took so long for us to get around to it, but we profile Lurchers in the Fido Facts section and we put the adorable Isabella on the cover. In 'I want One' you can win a pair of Brasher boots, a Canine Cooler bed, a pot of Hay Max, Some natural healing from Sol Healing products, a personalised collar and lead from Collar me Quick and an amazing Safestix from Kong. And lovely Victoria Stilwell launches Dog TV. Pat on the back is Natalie Ellis who braved Dragon's Den with the Road Refresher Bowl - a brilliant invention! And somewhere I mention the Government's chipping announcement which all kicked off just as we were going to press... what a month! I wish I could find Dogs Today in Canada, it looks like a great magazine.